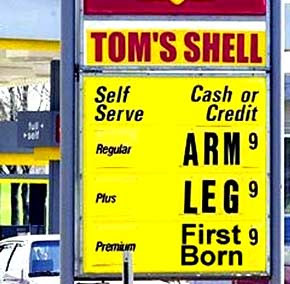 While not surprising, I find it interesting that wholesale prices for a gallon of gasoline have jumped from $3.00 to nearly $5.00 in the Gulf Coast states and the surrounding areas in anticipation of Hurricane Ike. Sure, the oil-pumping installations have all been shut down and will likely remain shut for a week, but I can’t see how prices TODAY are affected. If anything, it should be future gas prices that are affected by the nearly 20% cut in U.S. oil production for the week.